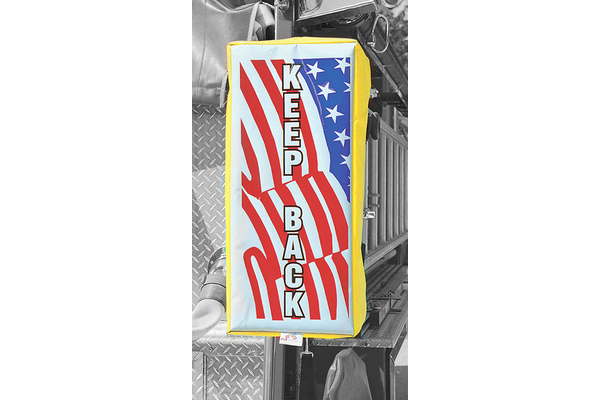 Fly our country's colors with this high quality ladder boot while providing protection to your firefighters. Constructed of vinyl-coated nylon which is impervious to oil, grease, abrasions, and tear resistant. Attaches with two 2" side release Derlin® buckles and a retainer strap. The full back panel is made of white 3MTM ScotchliteTM Reflective Material with a red and blue flag silk-screened in translucent ink with the imprint "KEEP BACK". Color: Yellow.Extra Large 8" deep x 11" wide x 25" high. Wt. 48 oz. All ladder boot measurements are inside measurements.